Masters of the Groove Get Loose and Propulsive Booker T. & The MGs recorded some of most enduring riffs and backbeats of the '60s. Because organist Booker T. Jones, guitarist Steve Cropper, bassist Donald "Duck" Dunn and drummer Al Jackson Jr. recorded together constantly, they developed a signature sound. 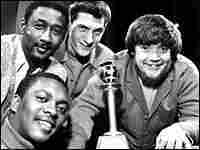 Did Booker T. & The MGs suffer in the marketplace because it was largely an instrumental group? 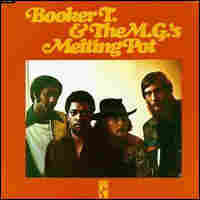 Discuss Booker T. & The MGs' work and submit a comment here. For a while in the late '60s, the house rhythm section at Stax Records in Memphis was the hottest in the world. Led by organist Booker T. Jones, Booker T. & The MGs provided Otis Redding and many others with instantly recognizable, perpetually in-motion backbeats. And in its spare time, the quartet recorded some of the era's most enduring instrumental riffs (notably 1962's "Green Onions," which grew out of a spontaneous jam). Because Jones, guitarist Steve Cropper, bassist Donald "Duck" Dunn and drummer Al Jackson Jr. recorded together constantly, they developed a signature sound — grooves that are taut and sweet and uncluttered, intensely propulsive yet forever relaxed. Everybody, from the Meters to Moby, learned something about groove music from the MGs. Still, Booker T. and crew weren't known for putting together great albums: The legacy rests mostly on "Green Onions" and the thinly veiled rewrites that followed on subsequent releases. Yet before it disbanded in 1971, the quartet recorded one of the most effortless-sounding groove records of all time, Melting Pot. Its simple, skeletal tunes align with the marathon musical adventures of the times: "Melting Pot" (audio), for example, lasts more than eight minutes. The compositions are all original, a contrast to the MGs' previous record, McLemore Avenue, an instrumental re-imagining of The Beatles' Abbey Road, and they touch on a range of styles, from agitated funk to thick and humid swamp-rock songs like "Fuquawi" (audio), which features Cropper at his most devastating. Then there's "Back Home" (audio), which begins as a revival-tent gospel workout but eventually detours into molasses-slow blues. To hear why this band was so revered, check out Cropper's sneaky lines and Jones' characteristically terse, carefully chorded piano solo. Unfortunately, these players weren't able to build on the adventurous spirit of Melting Pot: The group disbanded shortly after the album's release. The four remained in demand as session musicians, and after several years decided to reunite in 1975. Sadly, work on a comeback album was derailed the following year, when Jackson was murdered in a robbery attempt. The crime has never been solved.